Scuttled after fire in first carrier v. carrier battle, Lexington rests out of human reach. Paul Allen, the co-founder of Microsoft, has put his money into many passion pursuits. Underwater archaeology—specifically, finding ships sunk during World War II—is one of the most prominent. 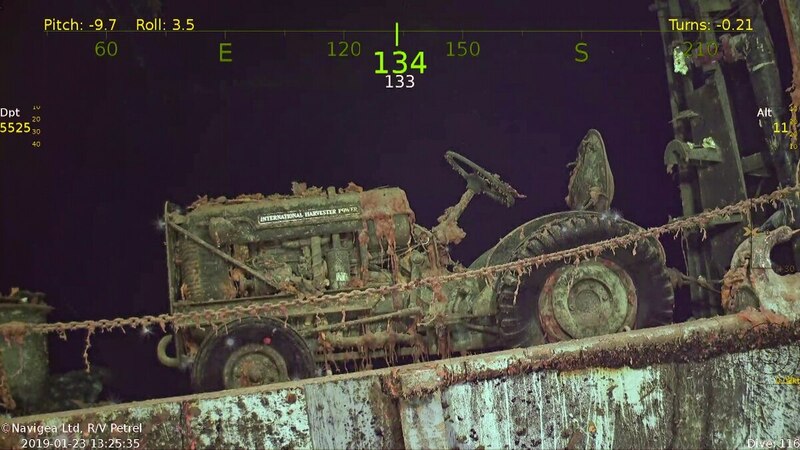 Last August, Allen's research vessel Petrel discovered the wreckage of the USS Indianapolis, the cruiser that delivered components of the two nuclear bombs dropped on Japan to close the war. A 2015 Allen expedition on his personal yacht Octopus recovered a bell from the HMS Hood, the Royal Navy cruiser sunk by the German battleship Bismarck that led to the loss of over 1,400 men. The expedition also surveyed the wrecks of "Ironbottom Sound" off Guadalcanal—the site of massive losses by the Allied navies during the long battle for that island. Now, the Petrel has located the USS Lexington—the aircraft carrier that, along with the USS Yorktown, fought the first-ever carrier duel with the Imperial Japanese Navy in the Battle of the Coral Sea. The Petrel located the Lexington's wreck with a Hydroid Remus 6000 drone submersible, an autonomous underwater vehicle equipped for searching large areas of seabed and rated for operations at 6,000 meters (3.7 miles). With its side-scan sonar, the Remus 6000 is capable of mapping over 100 square kilometers per deployment. The Petrel's Remus is the only privately owned AUV of its type in the world—others are operated by various navies and research institutions. An Argus 6000 remotely operated submersible was used to inspect the wreck visually. 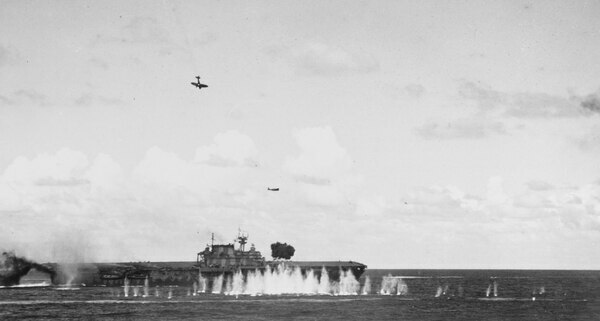 The damage dealt by the Lexington's and Yorktown's aircraft to the Japanese carrier Shōkaku, the decimation of the air wing of the carrier Zuikaku, and the sinking of the light carrier Shōhō would change the direction of the war, weakening Japan's naval air power just before the Battle of Midway. The battle also preempted a Japanese invasion of Port Moresby, Papua New Guinea, which would have allowed Japan to attack eastern Australia. Bombed and torpedoed multiple times, the Lexington was still afloat. But when fires caused by the bombing reached the Lexington's aircraft fuel stores and burned out of control, the ship had to be abandoned, and the destroyer USS Phelps was ordered to scuttle the ship with torpedoes. It took five to do the job because two torpedoes, including one located by the crew of the Petrel, were duds. The crew abandoned ship, but the Lexington went down with 35 aircraft aboard, settling to the bottom of the ocean two miles beneath the surface; 216 crewmembers died during the fight. Images from the Argus 6000 ROV show the Lexington and some of its aircraft in amazingly good condition after 76 years (or at least good condition for a ship that was deliberately sunk with torpedoes). Grumman F4F Wildcat fighters bearing the "Felix the Cat" logo of the VF-3 Navy fighter squadron (now carried on by the Navy's VF-31) were visible, as were Douglas TBD Devastator dive bombers. It is in really good condition for being in Sea Water for so long, a pity it isn't in more accessible Waters. It was found in 2017, Google will guide you. Lots of good pictures too. Last edited by tankgeezer; 04-24-2018 at 07:38 AM. It was noted in the very first part of the first paragraph of the story that this was already accomplished by the same individual. In fact, it was just done last year. Last edited by SusWar; 08-06-2018 at 10:34 PM. Thanks for the great info! It's really a treasure to keep. Two bombers damaged by anti-aircraft fire then slammed into the flattop, one into the carrier’s island and the other into the its port side. Nearly 77 years after the Hornet nuzzled into a watery grave, CBS shared the R/V Petrel’s crystal clear video with Nowatzki, who quickly noticed the gun he worked on.